"To a great person. RIP Ted, you were one of a kind and will be totally missed by all whose lives you touched." 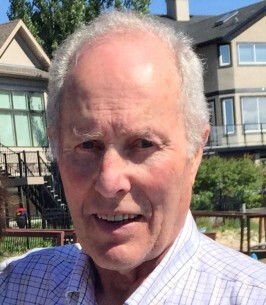 It is with great sorrow that the family of Ted Davis announces his passing on August 1, 2018 in Calgary, Alberta at the age of 79 years. Ted will be lovingly remembered by his spouse Virginia Janes; his children Charene Davis (Allen Ainscough), Regan Davis (Kristine Morrow), Lana Robinson (Bill); and eight grandchildren. He will also be sadly missed by his brother Robert Davis (Anne) and his nieces. Ted is predeceased by his father Douglas Davis, his brother Michael Davis, and his mother Ethel Davis. Born November 21, 1938 at Bishopdown Farm near Salisbury, England, Ted was the second youngest of two brothers, Robert (Bob) and Michael (Mike), and one sister Rosemary. Ted grew up on the family farm and attended the Young Farmers Society where he had the honor of delivering a speech at the Coronation of Queen Elizabeth II. Ted immigrated to Canada in 1957 arriving in Saint John, New Brunswick via the SS Empress of Britain. He worked on various ranches and in the oil industry before making Calgary, Alberta his home. He spent the majority of his career in the veterinary medicine business which ultimately lead to his own business, Anshire. Ted’s life was enriched by his family and grandchildren. His life-long passion was his love for breeding and racing thoroughbred horses celebrating many successes in this pursuit. Ted had a captivating zest for life. He brought energy into a room and a gathering was always more entertaining when he was present. His vitality was an inspiration. Ted’s family would like to express sincere gratitude to staff at the Chinook Hospice, Dr. Michael Forseth, and Palliative Homecare Team. To view and share photos, condolences and stories of Ted please visit www.choicememorial.com. We encourage you to share any memorable photos or stories about Neville. All tributes placed on and purchased through this memorial website will remain on in perpetuity for future generations. Ted Davis... Truly a great friend and wonderful company for an eclectic discussion on any topic, but particularly THOROUGHBRED HORSE RACING and PEDIGREES, or current politics. My deepest condolences to Ginny and Ted's extended family. He will be missed by all whose life he brightened with his visits. May he rest in peace, but will never be forgotten. To a great person. RIP Ted, you were one of a kind and will be totally missed by all whose lives you touched. Ted was a unique, bombastic and unforgettable character. His quick wit, his winning smile, and his keen observations about horses and racing have made an impact on all of us who knew him. He will be sadly missed and forever remembered. Love and condolences from me and Harvey to Virginia and family members. My heartfelt condolences to Teds family, much laughter and tears will be spent over the next while. I had the privilege of knowing Ted through my friend Donna Jones. There was one occasion when Ted hitched a ride when I was travelling from Calgary to Sooke on Vancouver Island ... as well as most people who have made that journey, it is a very long day. Ted was my perfect companion reciting many stores about his life and at the same time giving me a history lesson along the way. Have to admit it was probably one of the most interesting road trips I had the pleasure to experience.